You overwhelmed with data -- data about website performance, sales performance, product adoption, customer service, marketing campaign results ... the list goes on. And when you manage multiple clients with multiple sources of data, things can becoming overwhelming quickly. What should you be tracking? What actually matters? How do you visualize and analyze the data so you can extract insights and actionable information? And more importantly, how can you make reporting more efficient when you are managing 10 clients? One of the struggles that slows down my own reporting and analysis is understanding what type of chart to use and why. Even when I wrangle my data sets into an error-free spreadsheet, I'm left with questions about how to visualize it. 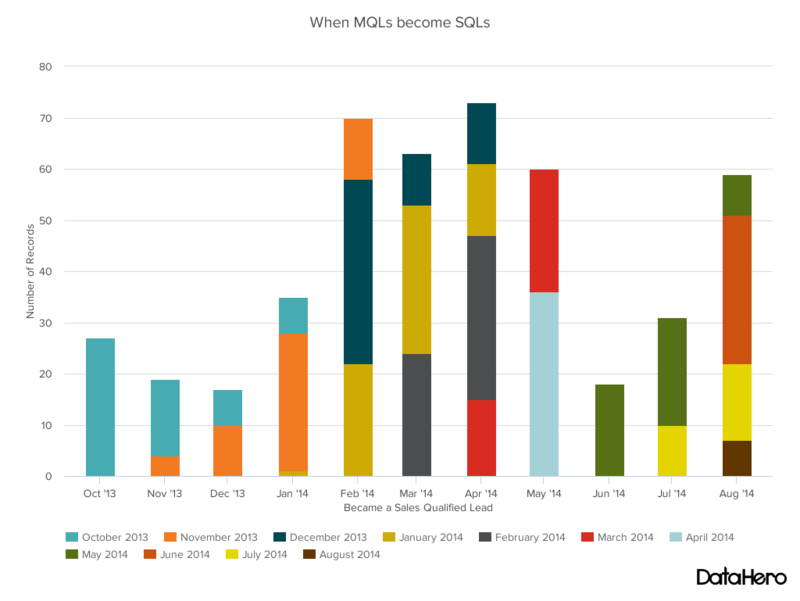 I usually default to a pie chart or a column chart because I feel those are "safe" options. Charts and graphs should clarify information. When you choose the wrong type of chart or simply default to the most common type of visualization, you could be going against this principle: you could either confuse the viewer or lead to mistaken data interpretation. 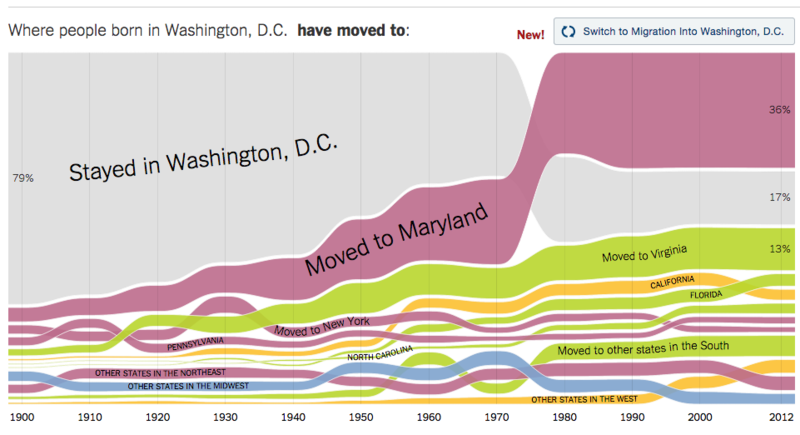 Consider this chart from The New York Times' project on where people born in a state move to. It visualizes a large amount of data accumulated during more than 100 years. Yet, it is easy to understand, and it clearly highlights interesting trends. 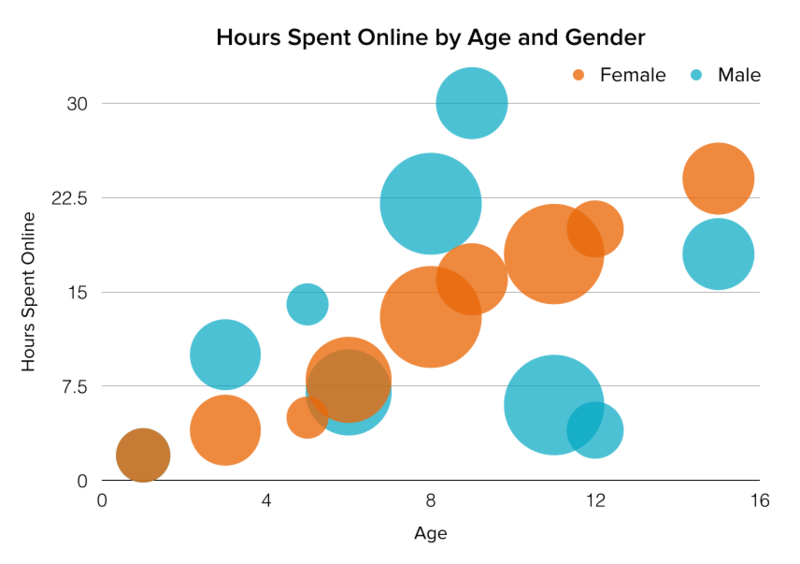 To create charts that clarify and provide the right canvas for analysis, you should first understand the reasons why you might need a chart. 1) Do you want to compare values? 2) Do you want to show the composition of something? Use this type of chart to show how individual parts make up the whole of something, such as the device type used for mobile visitors to your website or total sales broken down by sales rep.
3) Do you want to understand the distribution of your data? 4) Are you interested in analyzing trends in your data set? 5) Do you want to better understand the relationship between value sets? A column chart is used to show a comparison among different items, or it can show a comparison of items over time. 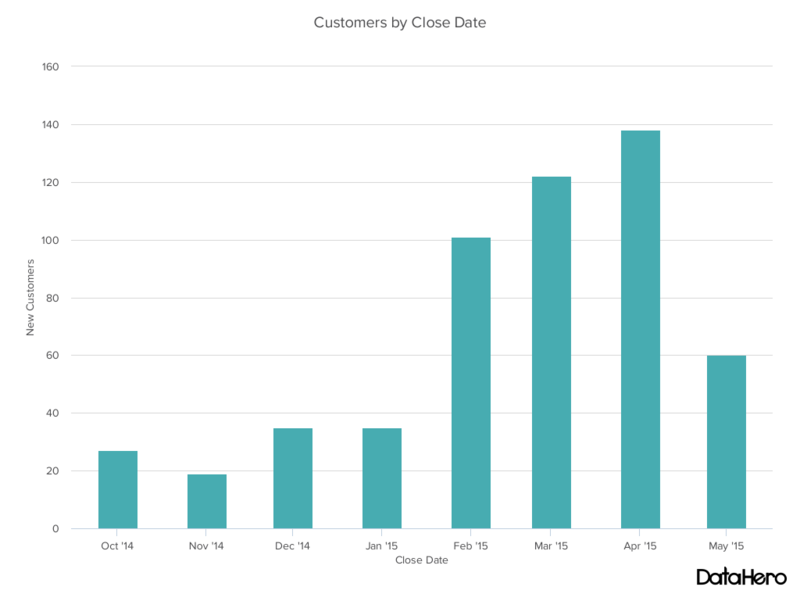 You could use this format to see the revenue per landing page or customers by close date. 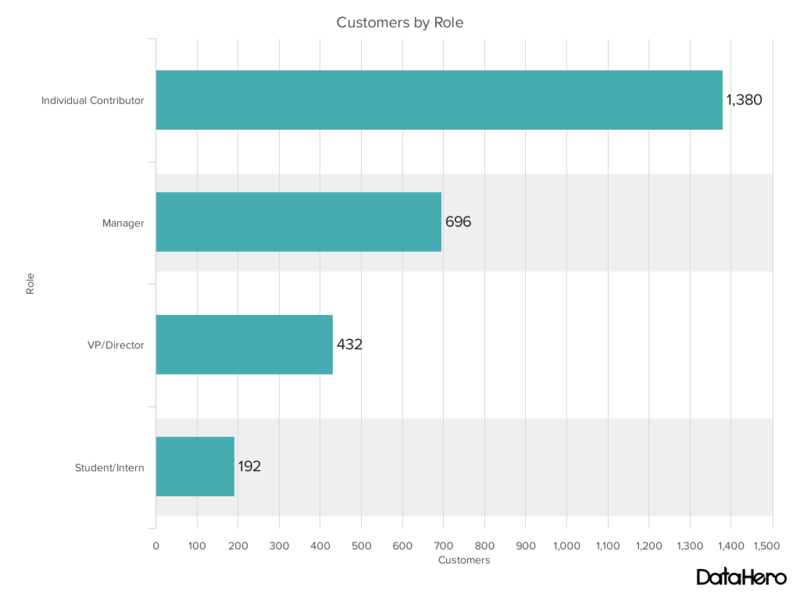 A bar chart, basically a horizontal column chart, should be used to avoid clutter when one data label is long or if you have more than 10 items to compare. This type of visualization can also be used to display negative numbers. A line chart reveal trends or progress over time and can be used to show many different categories of data. 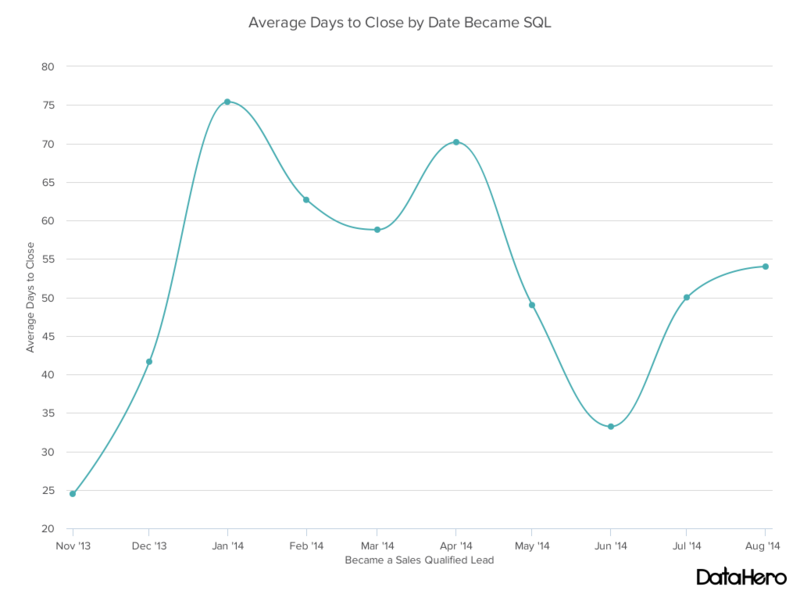 You should use it when you chart a continuous data set. 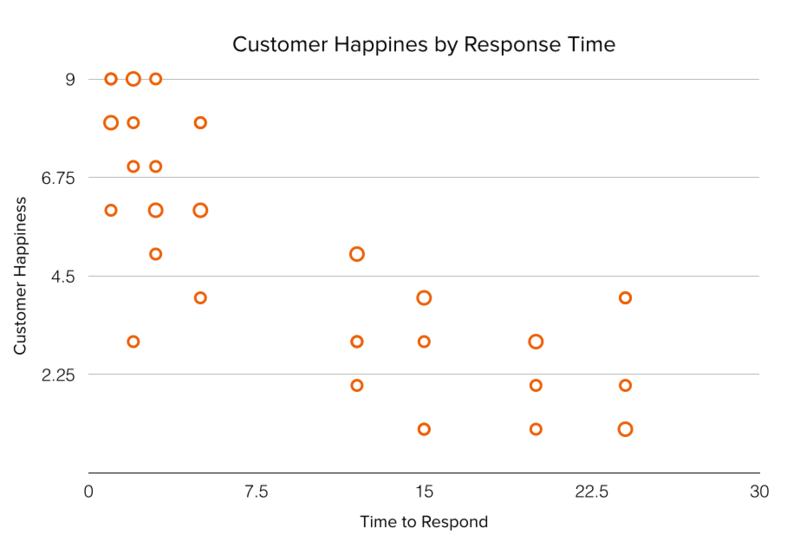 A dual axis chart allows you to plot data using two y-axes and a shared x-axis. It's used with three data sets, one of which is based on a continuous set of data and another which is better suited to being grouped by category. This should be used to visualize a correlation or the lack thereof between these three data sets. 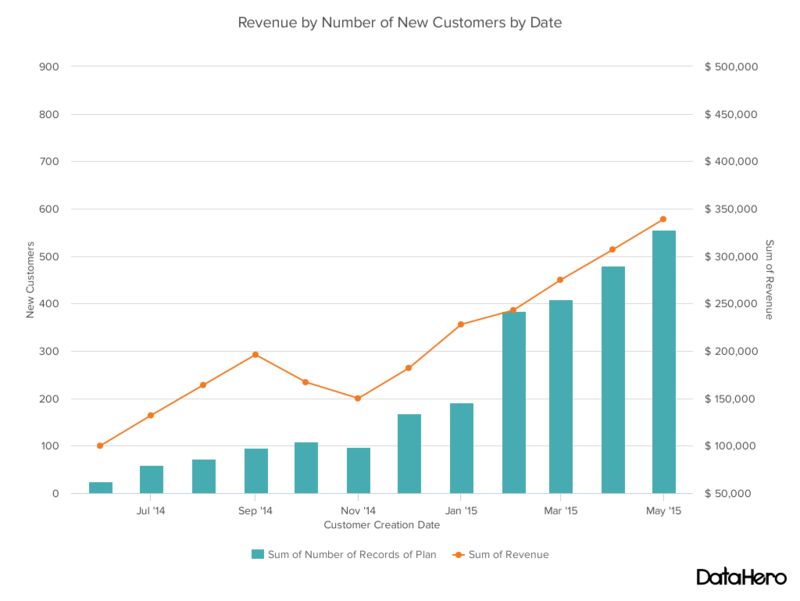 An area chart is basically a line chart, but the space between the x-axis and the line is filled with a color or pattern. It is useful for showing part-to-whole relations -- such as showing individual sales reps' contribution to total sales for a year. It helps you analyze both overall and individual trend information. This should be used to compare many different items and show the composition of each item being compared. A pie chart shows a static number and how categories represent part of a whole -- the composition of something. 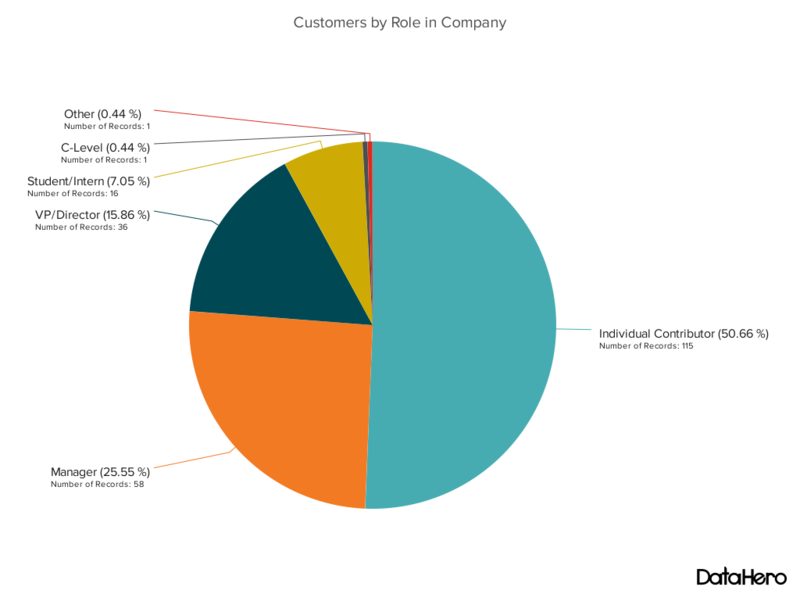 A pie chart represents numbers in percentages, and the total sum of all segments needs to equal 100%. A scatter chart will show the relationship between two different variables or it can reveal the distribution trends. It should be used when there are many different data points, and you want to highlight similarities in the data set. This is useful when looking for outliers or for understanding the distribution of your data. 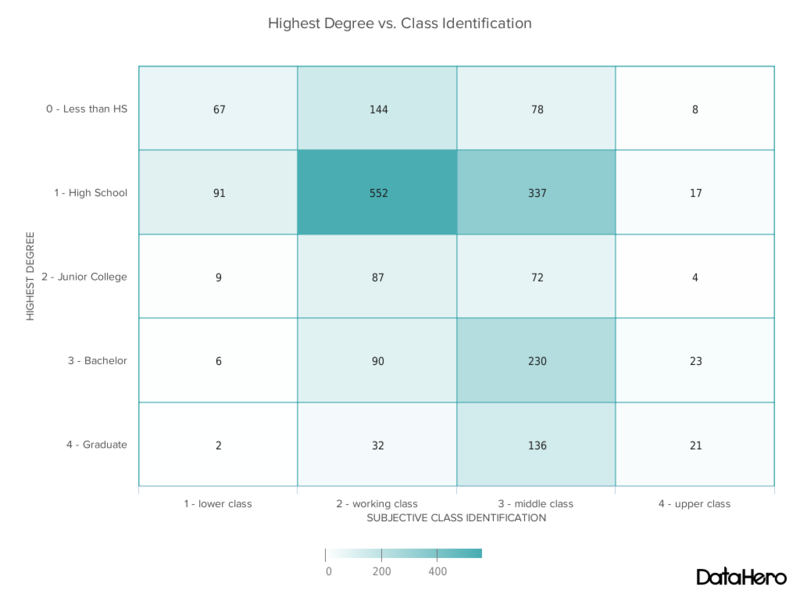 A bubble chart is similar to a scatter plot in that it can show distribution or relationship. There is a third data set, which is indicated by the size of the bubble or circle. 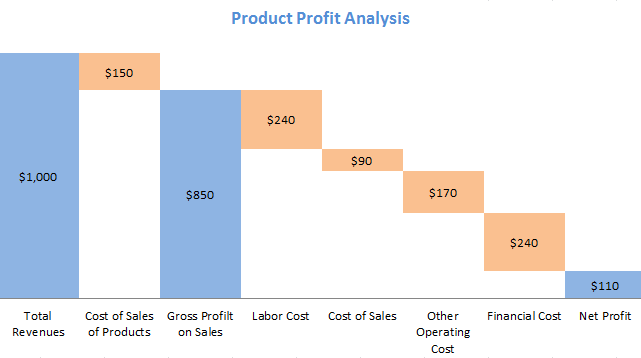 A waterfall chart should be used to show how an initial value is affected by intermediate values -- either positive or negative -- and resulted in a final value. This should be used to reveal the composition of a number. An example of this would be to showcase how overall company revenue is influenced by different departments and leads to a specific profit number. 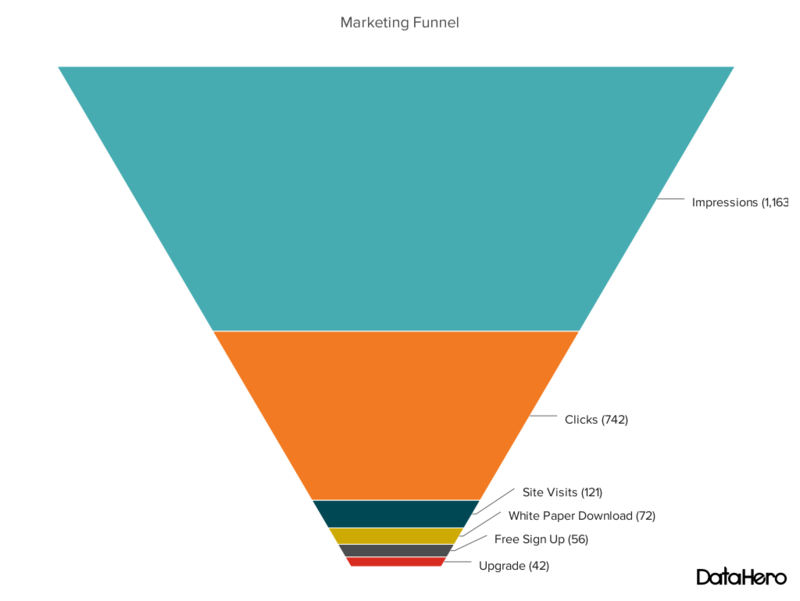 A funnel chart shows a series of steps and the completion rate for each step. This can be used to track the sales process or the conversion rate across a series of pages or steps. A heat map shows the relationship between two items and provides rating information, such as high to low or poor to excellent. The rating information is displayed using varying colors or saturation. 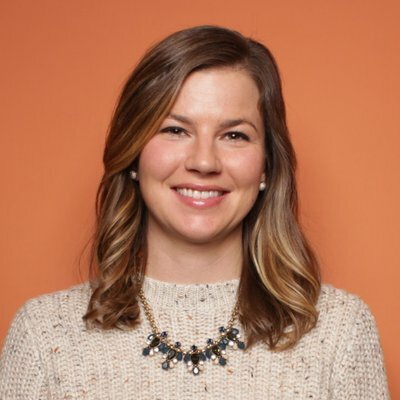 DataHero is now a HubSpot integration partner. 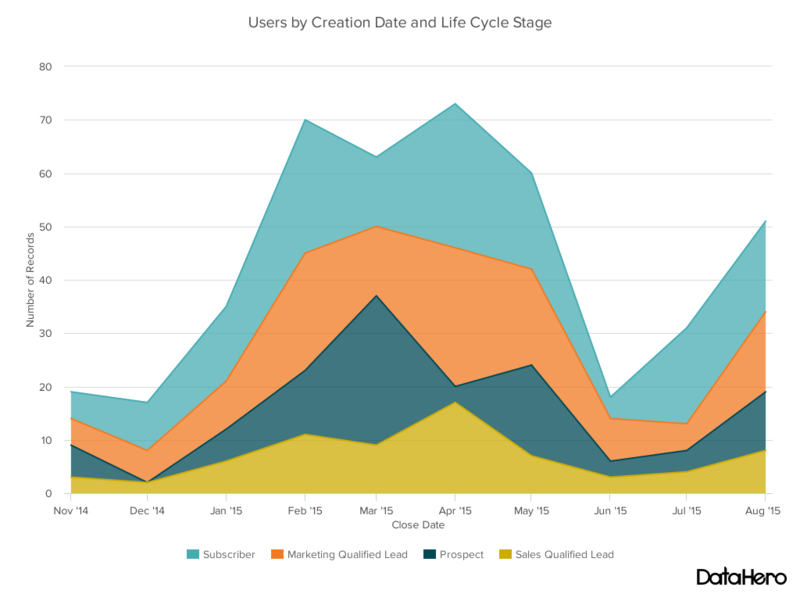 You can share customized dashboards and charts with HubSpot data and merged data from other business services. Check it out here.